While China’s energy system is still largely a “black” system depending on fossil fuel inputs, the electric power system is greening at the margins. We demonstrate, using 2014 data on additions to China’s electric power system, that the system is greening– with powerful implications for the future of the country’s energy profile. We utilize three lines of argument: first, utilizing data for electric energy generated, where we show that China actually generated less energy from thermal sources in 2014 than in 2013, while increasing generation from water, wind and solar; second, examining capacity additions, we show that new capacity in water, wind and solar (WWS) exceeded new capacity for thermal; and third, in terms of investment. We argue that such data rebut claims made that China is getting blacker while its greening efforts remain small and insubstantial, or that China will become dependent on nuclear power rather than hydro, wind and solar as it cleans its energy system.Many people have recently been avid viewers of Chai Jing’s riveting documentary/talk “Under the Dome” where she brings home the terrible costs of China’s pollution and its ultra-fast industrialization utilizing fossil fuels but particularly coal. Under the Dome is a call to China to wake up and start enforcing the environmental laws – against illegal polluters in factories, in trucks entering Beijing during the night, in smokestack industries throughout the country. It’s time to grow up, she seems to be telling her mostly young audiences. And the phenomenal success her video has had in China itself shows that she has struck a nerve, and could spark a people’s movement to rein in the pollution in China – just as Rachel Carson did in the US with “Silent Spring” published in 1962.But the counterpart to the story of needing to rein in the pollution is the necessity of building an alternative energy system, one which is based on renewable sources that do not emit carbon or other greenhouse gases. It is a fact that China’s energy system generally, and its electric power system in particular, is still largely based on fossil fuels consumption – just like every rising industrial power since the industrial revolution. But it also needs to be acknowledged that China’s energy system is greening – far faster than any other comparable sized system on the planet. Many commentators continue to insist (rightly) on the black character of China’s electric power system – but ignore (wrongly) the strength of the greening tendencies. In a widely reproduced blog posting, Armond Cohen (Executive Director of the Clean Air Task Force in the US) claimed that in 2014, “the amount of new coal energy added to the China grid … exceeded new solar energy by 17 times, new wind energy by more than 4 times, and even new hydro by more than 3 times”1 This assertion and the accompanying chart is meant to imply that China’s electric power system is getting blacker rather than greener. Such an interpretation of what has been happening in China’s power sector is wrong. 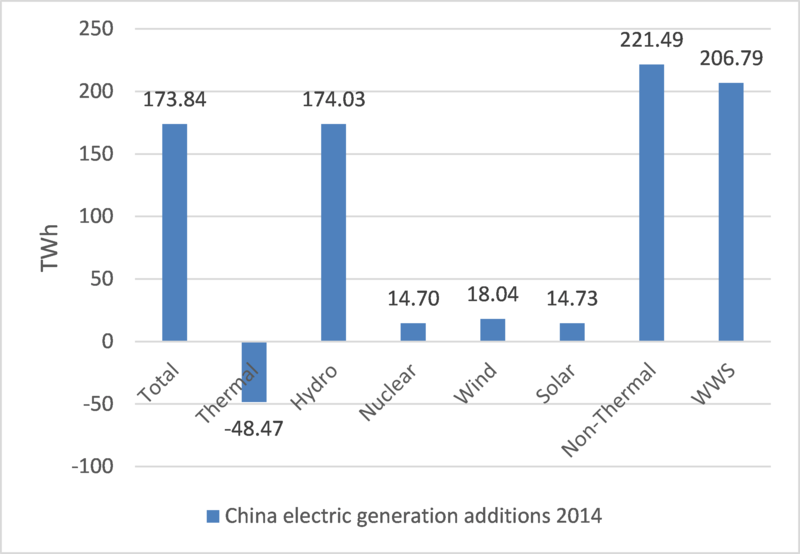 We use the latest 2014 data to demonstrate why it is wrong.The data for China’s electric power sector are now to hand, provided by the China Electricity Council. We use three sources of data to demonstrate that greening tendencies outrank blackening (fossil-fuelled) tendencies. These are data for 2014 electric energy generation (real generation, as compared with the “putative” generation utilized by Cohen – as discussed below); data for 2014 electric capacity additions; and data for investment in the electric power grid. All three sources demonstrate a greening tendency that outranks a blackening tendency. We hasten to add that building a green energy system is only one aspect of the problem, and (as Chai Jing insists) the existing pollution needs to be reined in, and new less-polluting technologies need to be introduced even while burning fossil fuels. But in this submission we focus on the building of a new green energy system and the progress that is being recorded. Data are now available from the China Electricity Council for real electric energy generation added to the system in 2014 from multiple sources. 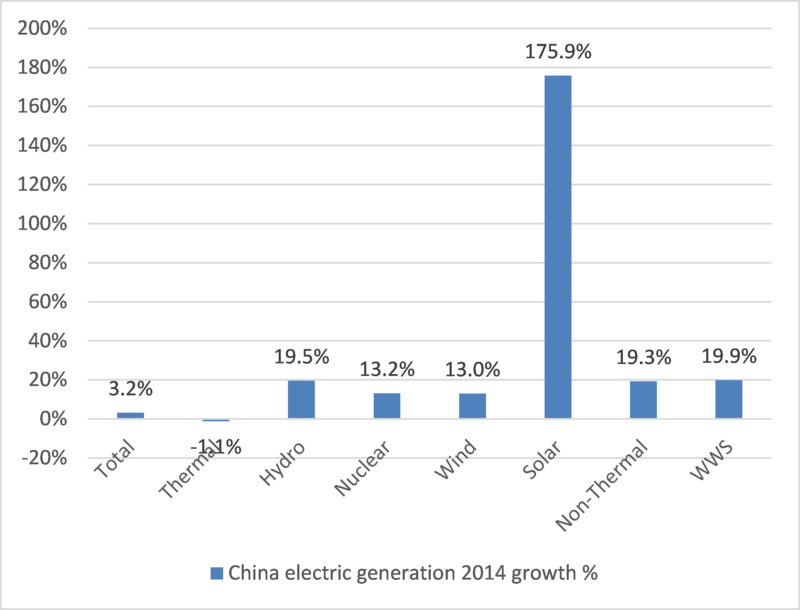 The headline results are that China generated less power from thermal (fossil fuel) sources in 2014 than in 2013, i.e. thermal power generation actually decreased in 2014. This is an extremely important milestone. By contrast, power generation from non-thermal sources increased by 19% — and strictly green sources, encompassing water, wind and solar (WWS), increased by 200 TWh, or 20%. This is the greening edge of a huge power generation system. Here are the data. China’s power system generated 5,545 TWh of electricity in 2014, an increase of 173 TWh over the 2013 total, or growth of 3.2%. So the system as a whole is still growing – but not as fast as the economy as a whole (an important disjunction). Thermal (mainly coal burning) sources generated 4173 TWh in 2014, down by 48 TWh from the 2013 total (or a decrease of 1.1%) – the first reduction in thermal power generation in recent times. Non-thermal sources by contrast accounted for 1372 TWh of electric energy generated in 2014, up 221 TWh on the 2013 total. Strictly green sources (WWS) generated 1245 TWh in 2014, up 200 TWh on the 2013 total (an increase of 20%). Nuclear generated 126 TWh, up 14 TWh on the 2013 total (+13%.). 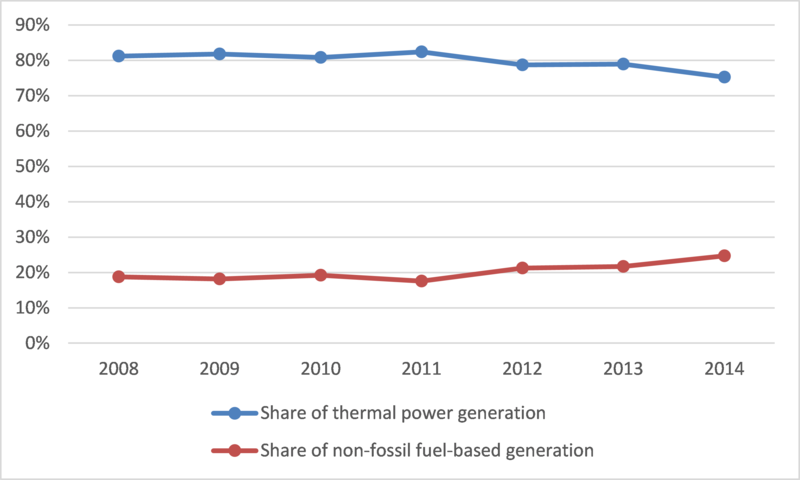 Expressed in terms of percentage changes to the system in 2014, thermal generation declined by 1.1% while WWS increased by 20%. The most dramatic growth was seen in solar power generation, which rose a staggering 175%. We present these data as in Charts 1a and 1b. 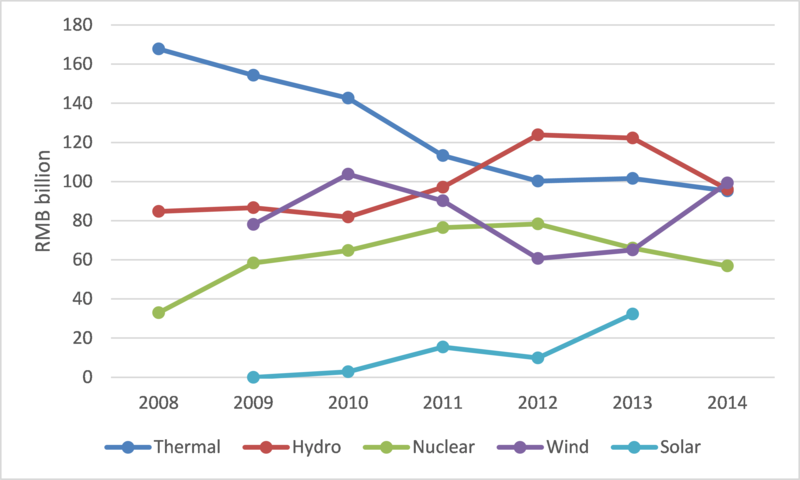 The charts show the 2014 additions (positive as well as negative) to the Chinese electric power generation system, in TWh, and in terms of percentage additions. Our chart differs greatly from the chart produced by Armond Cohen, referred to above. Cohen’s chart is based not on real electricity generation results, but rather on capacity additions in 2014 modified by assumed capacity factors. Cohen uses these quantities to produce notional additions to electric energy generated – additions he refers to as “electric generation capability additions”. His chart shows notional additions to thermal generation of 240 TWh compared with notional additions for water of 65 TWh, wind 57 TWh and solar 14 TWh; nuclear he shows as a notional addition of 42 TWh. He concludes that China added an extra (notional) 240 TWh from coal and only (notional) 136 TWh from WWS (plus 42 TWh from nuclear), so according to Cohen the system is getting increasingly “black”. We argue that this modelling approach has misled Cohen to derive conclusions that are at odds with empirical fact. In reality the system is greening at the margin, with actual thermal contribution to electric energy generated reducing in 2014 by 29 TWh and actual WWS sources increasing by 200 TWh – much higher than Cohen allowed for with his notional data. We await Cohen’s public response to our refutation of his widely reproduced blog posting. 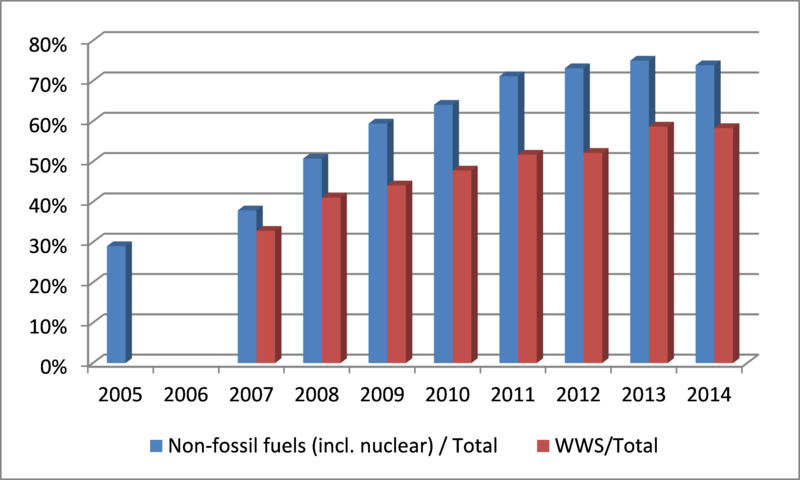 We elaborate on these data by showing historic trends in China’s thermal (Fig 2) and non-thermal (WWS plus nuclear) generation (Fig. 3) and the changes in the system’s composition (thermal vs. non-thermal) over the past six years. We also note that the figures cited herein provide the most accurate formulation of the current contribution of thermal sources to China’s electric power generation. The correct proportion is 75.2%, and not the widely quoted “approx. 80%” as cited repeatedly by the IEA and reproduced by authors such as Matthew Kahn in Science.4The share of fossil fuel-based power generation in China has in fact fallen from 81.2% in 2008 to 75.2% in 2014, roughly 1% per year. That is a significant rate of change for any power system, let alone the world’s largest. One would think the IEA would accord it the degree of accuracy it deserves and address its global significance. A second source of data on the greening of China’s electric power system is data on generating capacity itself. This does not give as accurate a picture of greening or blackening tendencies because of varying capacity factors for wind, solar, nuclear and thermal and their varying utilization hours from time to time – but when compared year by year the data do indeed indicate a trend in the generating capacity of the different sources. The headline result is that in 2014 China increased the capacity of its electrical generating “machine” to 1.36 trillion watts (TW) – by far the largest such power generating machine on the planet. (The US generating system stands at just over 1 TW.) 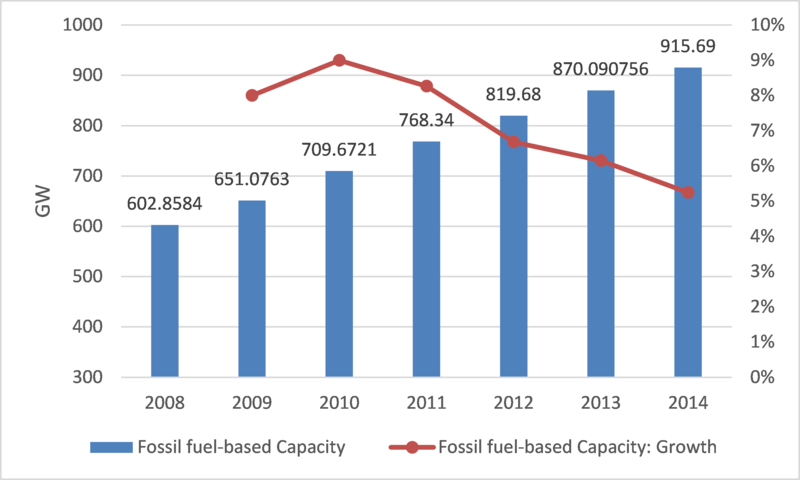 In 2014 China increased its non-thermal generating capacity by more than its thermal capacity – for the second year in a row. This is a second indicator of greening. In 2014 China increased its thermal generating capacity by 45 GW, reaching a total of 916 GW; while it increased non-thermal capacity by a larger amount, 56 GW, reaching a total of 444 GW. Strictly green sources (WWS) added capacity of 51 GW or 14% growth. There is an immediate issue to address in these data. 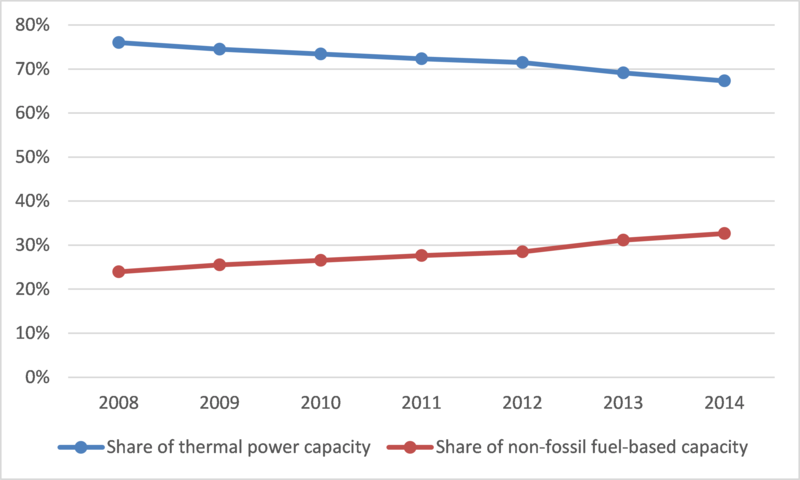 How could China add thermal capacity in 2014 but decrease its actual electric energy generation from thermal sources? There is an entirely plausible reason for this. The reason is reduced utilization of thermal capacity in 2014, as thermal power production was cut back in face of competition of non-fossil fuel-based power, as well as because of central government mandates. By contrast the utilization of WWS capacity was increased, diminishing the curtailment levels that had been keeping wind power under-utilized. (Curtailment refers to non-use of an energy source, by switching off its connection to the grid; thus power can still be generated, but is not utilized by the grid as a whole.) This also provides a plausible explanation for the difference between Cohen’s notional results, discussed above, and our results based on actual generation data. The data for generation capacity can be elaborated as per the following charts 5 (thermal capacity), 6 (non-thermal capacity) and 7 (proportions between thermal and non-thermal capacity). China’s non-thermal generating capacity, at 444 GW, is far higher than that of any other country. Its strictly green generating capacity (from WWS sources) stands now at 424 GW, with capacity addition in 2014 of 51 GW (meaning that a 1-GW non-thermal power station was added each week, on average). This 424 GW of green generating capacity shows just how much China is investing in the building of this enormous green infrastructure – contradicting the nay-sayers in the US Congress who greeted the US-China Climate Change Accord of 2014 as meaning that China would be “doing nothing” until 2030. On the contrary, China is building the largest green power source on the planet. But again we must add that enforcement of pollution laws and introduction of pollution-controlling technologies in the burning of fossil fuels are equally as important if China’s grave environmental problems are to be solved. Unlike other countries, China issues planning targets that then guide investment decisions. China’s official targets for renewable energy capacity additions appear to be fully attainable in light of these 2014 results. The ND&RC issued fresh targets for wind and solar PV in 2014, namely that China would have capacity of 70 GW solar PV and 150 GW wind power by 2017.5 The renewable energy targets thus far have been exceeded. In capacity terms, it is correct to state that China now has raised its non-thermal capacity to close to one third of its total power system (and its strictly WWS green capacity to 31%) – in excess of official targets as outlined in the 12th FYP and subsequent Energy Policy statements. 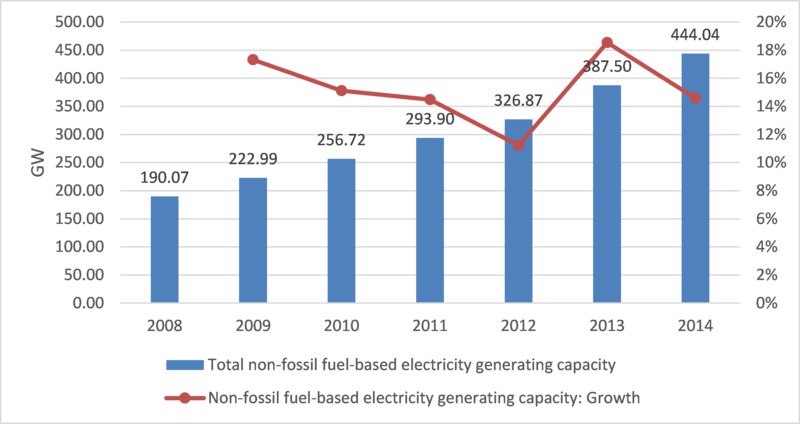 The Energy 12th FYP issued in 2013 projected that China’s non-fossil fuelled generating capacity would reach 30% by 2015. This target has now already been exceeded. Future targets, such as a projected goal for WWS energy sources of reaching 650 GW capacity by 2017, are also likely to be exceeded. Fig. 8. Proportion of installed power capacity from renewable sources (hydro, wind and solar): 1990 -2014, and the estimate of the 2015 target based on the 12th FYPSource of primary data: data for wind and solar power capacity up to 2013 are available from BP 2014 Review of Statistics, data for the total electric capacity and the hydroelectric capacity up to 2012 is available from the US EIA; other data are available from the China Electricity Council..
We provide an historical overview of China’s changing capacity structure, showing green sources as a proportion of the total electric power system. The share of electric power generation capacity based on non-fossil sources, especially the WWS sources, has steadily increased since 2006, when China started to pursue a green growth strategy (Fig. 8). Based on the recent development in new WWS capacity addition, it appears that the target in China’s Energy Development 12th Five Year Plan (FYP) for 2015 (about 29% from a calculation based on the estimates of the total electric generation capacity and those of individual technologies specified in the 12th FYP) has already been exceeded. These again are momentous results, of enormous benefit to China and to the world. A third source of data regarding the greening vs. non-greening of the electric power system is investment. Again the data indicate that China is investing more heavily in green sources of electric power than in non-green (thermal). Indeed China is investing more in its green energy system than any other country. Investment in thermal generation facilities has consistently declined, from RMB 167 billion in 2008 to RMB 95 billion in 2014 (approx. US$15.2 billion) , while investment on non-thermal sources has increased, from around RMB 118 billion in 2008 to at least RMB 252 billion in 2014 (approx.. US$40.3 billion). (We cannot be more precise because of a lack of data on investment in wind and solar power for several years during the recent period.) Total investment for the different sources in the years up to 2014 are shown in Fig. 9. Note that investment in both wind and hydro outranked investment in nuclear sources in 2014. In terms of the investment in electricity generation capacity based on different technologies, the share of investment in renewable (WWS) electric generation has increased steadily, from 32% of the total in 2007, passing 50% in 2011 and reaching 59% in 2013. Adding the investment in nuclear power, the proportion of investment in all non-fossil fuel-based electric generation increased from less than 30% in 2005, to 37% in 2007 to 75% in 2013 while investment in thermal power plants declined from 71% to 25% during the period between 2005 and 2013 (Fig 10). 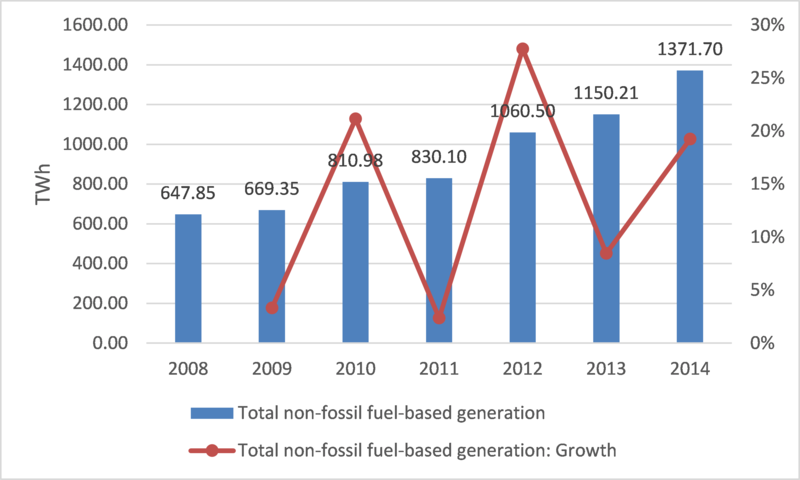 The level of investment in non-fossil fuels-based electricity generation declined slightly in 2014, according to the latest data released from the China Electricity Council in Feb 2015, but still staying high at a level of 74%. 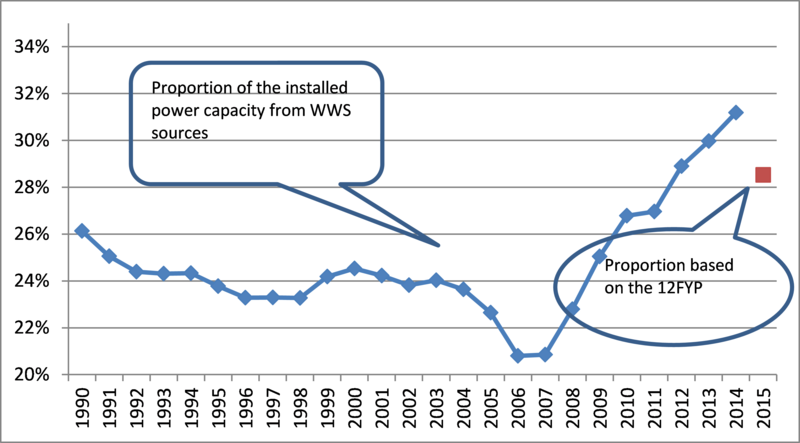 It is important to add that the rapidly declining costs of most WWS capacity, especially solar, means that a given level of monetary investment yields far more delivered power. The same is not true of nuclear or thermal, whose total costs and unit-generation costs have increased. We have shown that the China electric power system is greening rapidly at the margins, at the point of change. All the data for additions to the system in 2014 indicate that it is greening more than it is blackening. 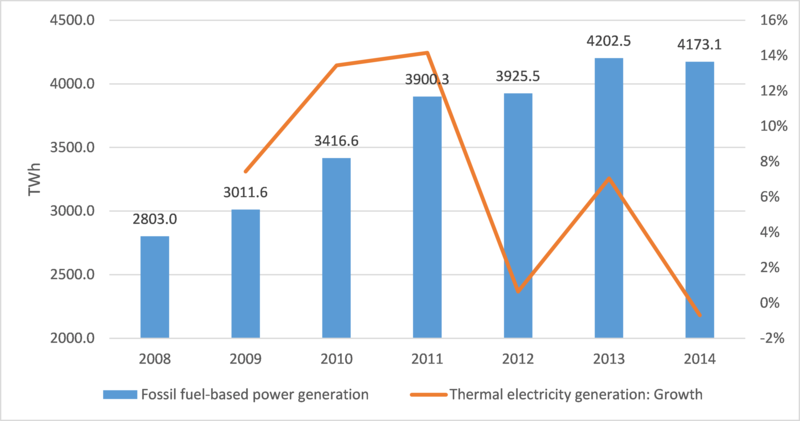 First, in terms of total electricity generated, thermal generation actually decreased in 2014 while generation from WWS sources increased by 20%, or by 200 TWh in absolute terms. Second, in terms of capacity additions, more capacity was added from non-thermal sources (56 GW) than from thermal sources (45 GW) – with thermal sources being exceeded even by strictly green capacity additions (from WWS) of 51 GW. (We indicated above why we think it plausible that there could be capacity additions for thermal in 2014 but a reduced amount of electric energy generated.) Third, in terms of financial investment, the year 2014 again indicated that green sources were invested in at a much higher rate than non-green (thermal) sources. We have emphasized that the greening of China’s power system is only one facet of the need to address and resolve the country’s massive pollution and smog problems, which all stem in one way or another from pollution from fossil fuel burning factories, vehicles, ships and households. There is an energy revolution underway in China, and a huge problem to address – but there are also new means of addressing the problem, including the use of social media and the creation of a popular movement as advocated in “Under the Dome”. Since so much hangs on the success of China’s energy reforms, and in particular on its efforts to build the world’s largest renewable power system – far larger than anything attempted in the West – it is important to report accurately on the system as it evolves, in order to comprehend the overall direction of change. Certainly it remains the case that China’s electric power system is still largely coal-based, and a lot more coal is going to be burnt before the system can be described as more green than black. But the direction of change is clear – and this needs to be acknowledged, and factored into global energy discussions. Hao Tan is senior lecturer at Newcastle Business School, University of Newcastle, Australia. At UoN he currently serves as an acting Head of the International Business Discipline and a Program Convenor of Master of International Business. He is an associate of the Centre of Asian Business & Economics at University of Melbourne, and was a visiting professor at National Tsinghua University in Taiwan in 2014. Hao Tan’s current research interest is in China’s energy transition. Since 2009, he has published over 20 scholarly journal articles and book chapters, including a commentary article in the leading science journal ‘Nature’ (co-authored with John Mathews). He is a frequent contributor to both English- and Chinese-language media channels such as UK Financial Times’ Chinese website, China’s Caixin and Australia’s theconversation.com, on energy and environment-related issues in China. 1 See Armond Cohen, Feb 18 2015, “No China coal peak in sight: carbon capture will be necessary to tame emissions in this century”, Clean Energy Task Force. 2 This is an argument used frequently by US climate scientist James Hansen, in Congressional testimony. See for example his testimony on 13 March 2014 before the Senate Foreign Relations Committee. 4 See Matthew Kahn, “Fueling the future”, Science, 16 Jan 2015, where he states “China uses [coal] to generate roughly 80% of its electricity” – an assertion sourced to the International Energy Agency (IEA). 5 For commentary on this ND&RC statement, see “China, US look to boost solar and wind capacity”, Giles Parkinson, RenewEconomy, 19 May 2014. 6 Given the lack of data for the investment in solar power projects, the proportion of investment in renewables-based on electricity generation is calculated as a residual of the total investment on electricity generation in China and the investment on fossil fuels-based projects.